Located in Southern California, Vista is about 7 miles from the Pacific Ocean. Its total area is 18.7 square miles. It can be accessed through State Route 78. Other major roads include Vista Village Drive and Santa Fe Avenue. Like other areas with a lot of vehicles on the road, unfortunately Vista sees its fair share of accidents, including those involving semi-trucks. Semi-truck accidents are often devastating to pedestrians and those in smaller vehicles. They can result in catastrophic injuries or death. If you were injured in a semi-truck accident caused by someone else, you may be able to recover damages. An experienced Vista truck accident lawyer at the Rubinstein Law Group can review the facts of your case, and help you pursue the compensation to which you may be entitled. Commercial semi-trucks are heavy and large. It can take more effort to slow down a semi, and collisions with these vehicles often result in severe injuries or death due to the immense size and weight of the trucks. Catastrophic injuries can include crushed limbs, amputations, burns, broken bones, fractures, disfigurement, traumatic brain injury, and paralysis. Sometimes semi-truck accidents are fatal, and they can be fatal not just to one person, but to many people with whom the semi-truck driver shared the road. If you were injured in a semi-truck accident, you may be able to recover damages from a negligent truck driver. To establish his negligence, you'll need to show that it's more likely than not that the following elements can be fulfilled in your case: (1) the driver owed you a duty of reasonable care, (2) the driver breached that duty, (3) actual and proximate causation, and (4) actual damages. A truck driver may breach the duty to use reasonable care by speeding, weaving, driving drunk, texting, tailgating, failing to check blind spots, and driving while distracted or fatigued. Interstate truck drivers are required to follow the Federal Motor Carrier Safety Administration (FMSCA) regulations in connection with hours of service, logbooks, maintenance, securing of cargo, and other matters. 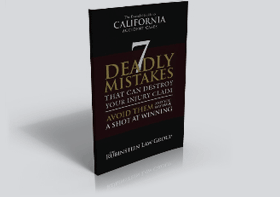 Failure to follow the regulations can be strong evidence of negligence or may even support a negligence per se claim. Often semi-truck accidents have multiple victims, and a driver's individual insurance policy may have insufficient coverage for numerous catastrophic injuries with all the costs that these cases entail. It can be important to examine the accident closely to determine whether there are other potential defendants. A trucking company that employs a negligent driver may be vicariously liable for the driver's negligence in the course and scope of employment. However, a trucking company may also be held accountable for its own negligence in hiring, supervising, or training a truck driver. For example, if a trucking company failed to conduct background checks and drug and alcohol testing during the hiring process, and a driver with a history of DUIs gets into a fatal drunk driving accident on the road, the trucking company may be liable for negligent hiring. A skilled injury lawyer can investigate and gather evidence regarding accident causes of this nature. Often a truck driver or trucking company will defend itself by claiming the accident victim was comparatively negligent. When comparative negligence is raised, the jury will evaluate the evidence and arguments, determine the total damages, and assign each party a percentage of fault. As a plaintiff, your damages will be reduced by an amount equal to your degree of fault. For example, if a truck driver failed to check his blind spot and started to crush your car causing you injuries, but you contributed to the accident by trying to squeeze into the opening to cut in front of the truck instead of waiting for the truck's turn to be completed, the jury might find the driver 50% at fault and you 50% at fault. In other situations, a semi-truck accident may be caused by the negligence of a third party loader or a mechanical malfunction. It may be possible to sue the third party loader or bring a product liability lawsuit against the truck manufacturer. If you were injured in a semi-truck accident, it may be difficult to know where to turn. You are probably facing unpaid medical bills, missed work, lost earning capacity, and many more obstacles due to your injuries. A knowledgeable accident lawyer can help. At The Rubinstein Law Group, we are experienced in making strong cases and pursuing the maximum compensation for accident victims in Vista and other nearby communities. For a free consultation, please call 866-771-7181 or contact us through our online form.